Marco Granados Rocky Mountain Tour - Integral Steps, an integrative education non-profit supporting the balanced development of individuals, families and communities, through music, movement, psychotherapy, ecology and creative arts! Colorado and Portland based! Heroes & Heroines, Ents & Elves! 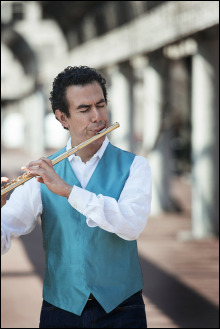 We are pleased to announce that Wm S. Haynes Artist Marco Granados will be coming to Colorado in March to judge the Colorado Flute Association high school competition. His beautiful composition "La Bella" has been chosen as the required piece for the high school division. As a Haynes performing artist, Granados has traveled the globe inspiring students and audiences with his artistry. 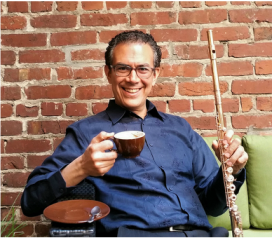 Through collaboration with Integral Steps, a Colorado based integrative non-profit co-directed by flutist and Dalcroze educator Emma Shubin, Wm S. Haynes, and Ellen Ramsey Flutes, Marco will present a series of masterclasses and workshops to our Colorado community. Marco will be available for limited lessons throughout the Front Range during his stay. Request a masterclass slot at below. To schedule a lesson, email Emma Shubin at integral.steps@gmail.com. *limited spaces available! masterclass tuition is $40/performers or $20/auditors for non-CFA members, $20/performers or $10/auditors for CFA members - performing ​includes attendance to the evening concert! Register below! +tickets are a suggested donation of $25, limited seating available, RSVP at integral.steps@gmail.com - those attending the evening concert are welcome to audit the afternoon class at no additional charge! Ellen Ramsey Flutes, located in Longmont, is Colorado's premier full service flute specialty shop offering a large selection of instruments and services. "We have opened up our beautiful performance space for recitals, masterclasses and events like this one with Marco Granados who is a Haynes artist. During this special event, you will be able to play test from a selection of Haynes flutes as well." Buy tickets for Marco's concert by clicking on the button below! - featuring Granados' composition "La Bella"
during his Rocky Mountain Tour!